A Call for Submissions for Sharing the Legacy, happening between the 24th-26th October, is open until the 29th March. 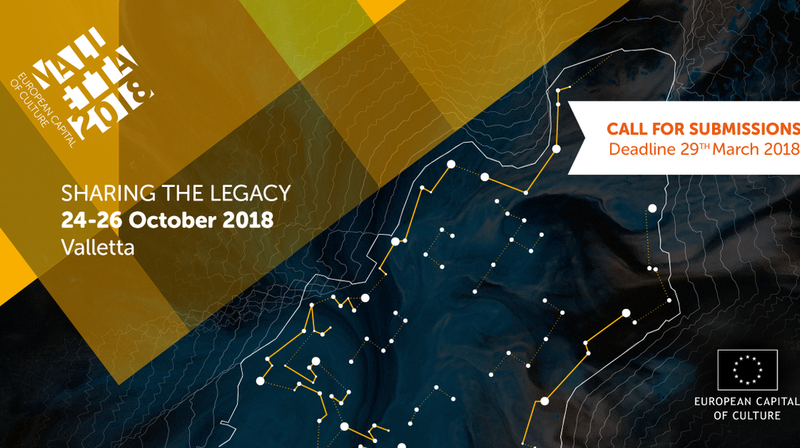 The Valletta 2018 Foundation has launched a Call for Submissions for the fifth in a series of annual conferences titled Sharing the Legacy. Interested applicants are requested to submit an abstract of their proposal by the 29th March. Proposals that address various forms of presentations, including performative, artistic, or academic intervention, are encouraged. The conference is to be held from the 24th till the 26th October. Sharing the Legacy encourages broad reflection on the central issues that define urban life by channeling its discussions through the basic question of “What makes a city better?” This reflection aims to understand how cities can be shaped to better suit the needs and desires of the individuals and communities that it hosts, whether on a permanent or temporary basis. This concept develops the discussions held at previous Valletta 2018 conferences, particularly on the themes of well-being and happiness of residents, participation in cultural and creative life, dialogue and inclusion amongst different communities, and social and environmental sustainability, amongst others. The conference will adopt Jane Jacobs’ oft-cited maxim that “Cities have the capability of providing something for everybody, only because, and only when, they are created by everybody” (1961) to question whether this is an approach that is being adopted in the urban development taking place in different cities, including those engaging with the title of European Capital of Culture. Through these discussions, the conference aims be a reiteration of the democratic process through cultural practice, whereby the relationship between the individual, the collective, and their communities is realised by means of a tangible legacy. These concerns will be addressed through the following thematic strands: (i) Culture, Politics & Capital in Urban Transformation; (ii) Renewal of the City; (iii) The Unintentional Legacy; and (iv) Understanding the City. Further information on each of these themes, as well as on the conference objectives is available in the full call for submissions, available on conference.valletta2018.org or by emailing [email protected].